Athens is known for historic sites, museums, shopping, nightlife, and fun & games. Your plan includes some of its best attractions: explore the ancient world of Acropolis of Athens, take in nature's colorful creations at National Garden, appreciate the history behind Temple of Olympian Zeus, and take a stroll through Plaka. Make your Athens itinerary with Inspirock to find out what to see and where to go. Use the Route module to find suitable travel options from your home destination to Athens. In June, daytime highs in Athens are 35°C, while nighttime lows are 24°C. Finish your sightseeing early on the 4th (Tue) to allow enough time to travel to Heraklion. 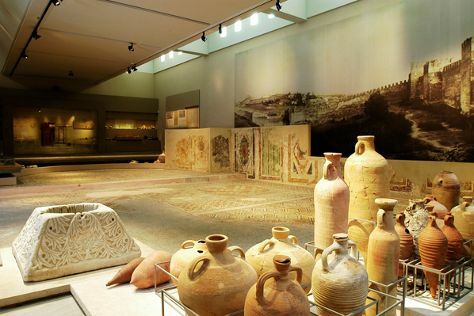 Kick off your visit on the 5th (Wed): admire nature's wide array of creatures at Aquaworld Aquarium & Reptile Rescue Centre, then delve into the distant past at The Palace of Knossos, and then take an in-depth tour of Heraklion Archaeological Museum. Get ready for a full day of sightseeing on the next day: meet the residents at Cretaquarium - Thalassocosmos, examine the collection at Kazantzakis Museum, then get a new perspective on nature at The Natural History Museum of Crete, then get engrossed in the history at Ιστορικό Μουσείο Κρήτης - Historical Museum of Crete, and finally take in the architecture and atmosphere at Church of Saint Titus. For traveler tips, reviews, more things to do, and other tourist information, use the Heraklion trip builder website . You can do a combination of subway and flight from Athens to Heraklion in 3 hours. Alternatively, you can do a combination of taxi and ferry; or ride a ferry. While traveling from Athens, expect little chillier days and about the same nights in Heraklion, ranging from highs of 32°C to lows of 22°C. Wrap up your sightseeing on the 6th (Thu) to allow time to travel to Oia. You'll find plenty of places to visit near Oia: KAMARA BEACH (in Kamari), Oneiro Jewelry (in Fira) and Akrotiri (Red Beach & Akrotiri). 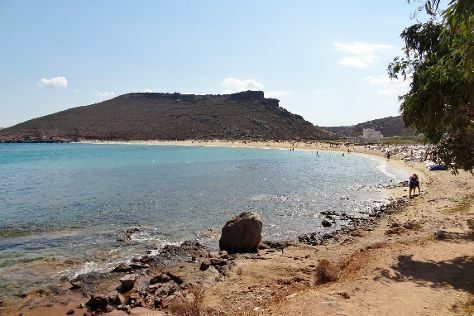 And it doesn't end there: explore the activities along Amoudi Bay, take in the exciting artwork at Ernesto Workshop & Gallery, tour the water at your own pace with Alex Private Boat Rental, and stop by Sand Lily Boutique. To see other places to visit, more things to do, and more tourist information, go to the Oia itinerary builder tool . Ride a ferry from Heraklion to Oia in 2.5 hours. Alternatively, you can fly. 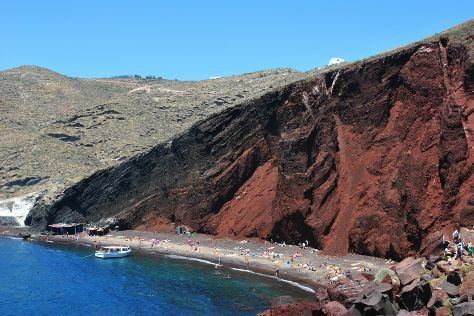 In June, daytime highs in Oia are 32°C, while nighttime lows are 24°C. Finish your sightseeing early on the 9th (Sun) so you can travel to Mykonos Town. Mykonos Town is known for nightlife, beaches, museums, historic sites, and adventure. Your plan includes some of its best attractions: see the interesting displays at Aegean Maritime Museum, make a trip to The Windmills (Kato Milli), tour the water at your own pace with Mykonos Paradise Cruises, and tour the pleasant surroundings at Fokos Beach. To see other places to visit, maps, reviews, and tourist information, read Mykonos Town trip planner . Getting from Oia to Mykonos Town by ferry takes about 3 hours. Other options: fly. Expect a daytime high around 31°C in June, and nighttime lows around 24°C. Finish up your sightseeing early on the 12th (Wed) so you can travel to Thessaloniki. 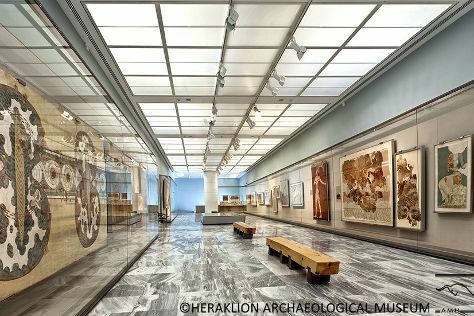 On the 13th (Thu), pause for some serene contemplation at Hagios Demetrios, pause for some photo ops at Arch of Galerius, then take in panoramic vistas at White Tower of Thessaloniki, then get engrossed in the history at Museum of Byzantine Culture, and finally make a trip to Aristotelous Square. For traveler tips, photos, and other tourist information, go to the Thessaloniki planner . Do a combination of flight and bus from Mykonos Town to Thessaloniki in 3 hours. Alternatively, you can do a combination of ferry, bus, and flight; or do a combination of ferry and car. When traveling from Mykonos Town in June, plan for somewhat warmer days in Thessaloniki, with highs around 35°C, while nights are about the same with lows around 21°C. Finish up your sightseeing early on the 13th (Thu) so you can go by car to Kalambaka. 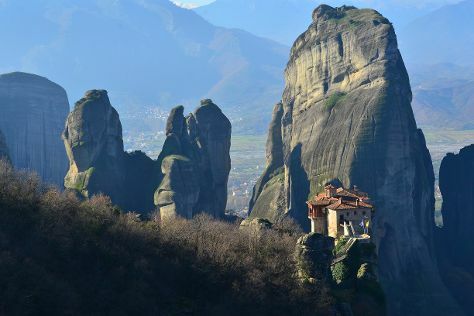 The gateway to one of the largest monastery complexes in Greece, the small town of Kalambaka nestles against a landscape of imposing rock formations rising 400 m (1,300 ft) into the air. Nearly leveled during World War II, the town rebuilt and reinvented itself in the post-war period, quickly becoming one of the region's major travel destinations. Kick off your visit on the 14th (Fri): stroll through Meteora, contemplate in the serene atmosphere at Monastery of the Great Meteoron, then tour the pleasant surroundings at Varlaam Monastery, then contemplate in the serene atmosphere at Holy Trinity Monastery (Agia Triada), and finally take in the spiritual surroundings of Agios Nikolaos Anapaphsas. For where to stay, reviews, photos, and more tourist information, refer to the Kalambaka trip itinerary planning tool . Traveling by car from Thessaloniki to Kalambaka takes 3 hours. Alternatively, you can take a bus; or take a train. Traveling from Thessaloniki in June, expect little chillier with lows of 17°C in Kalambaka. Cap off your sightseeing on the 14th (Fri) early enough to go by car to Nafplio. Nafplio, a city famed for its narrow lanes and elegant architecture, provides a comfortable base for exploring the many surrounding ancient sites. Get out of town with these interesting Nafplio side-trips: Corinth (Archea Korinthos & Acrocorinth) and Epidaurus Theater (in Epidavros). And it doesn't end there: step into the grandiose world of Palamidi Castle, get engrossed in the history at Peloponnesian Folklore Foundation, delve into the distant past at Archaeological Site Mycenae, and take in the waterfront at Nauplion Promenade. For traveler tips, more things to do, ratings, and other tourist information, read Nafplio trip itinerary maker tool . You can drive from Kalambaka to Nafplio in 5.5 hours. Other options are to do a combination of car, flight, and bus; or do a combination of train and bus. In June in Nafplio, expect temperatures between 33°C during the day and 14°C at night. Finish your sightseeing early on the 17th (Mon) to allow enough time to drive back home.